If you are planning a North Coast 500 road trip and want to combine some fly fishing with sightseeing, you are in for a treat. The NC500 route passes over dozens of salmon rivers, and through some of the best wild brown trout fishing country in Europe. Most of the best trout fishing areas are described in our Trout Fishing section on the main menu. 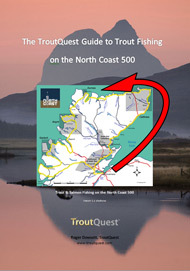 At the bottom of this page you will find our Visitor's Guide to Trout Fishing on the North Coast 500' available as a download. A few of our local rivers are described in the Salmon Fishing section, but there is also a page there dedicated to NC500 Salmon Fishing, where you can also download our 'Visitor’s Guide to Salmon & Sea Trout Fishing on the North Coast 500'. We can offer guided fly fishing at several locations on the North Coast 500 route, so please get in touch if you would like a fly fishing experience or excursion and we will let you know what's possible. 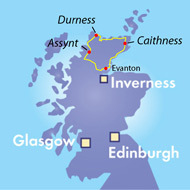 The North Coast 500 is a 500-mile scenic coastal tourist route starting from Inverness, that has gained worldwide interest in recent years. Of course the roads and magnificent scenery have been there all along, it's just the marketing that has increased awareness. If you are a fly fisher and travelling on the NC500 has caught your imagination, we can offer you a tour combining driving part or all of this iconic route with some of the best wild brown trout fishing in the UK. We can pick you up from Inverness, and take you by 4WD vehicle on a fly fishing adventure on the North Coast 500 tourist route through Wester Ross, Sutherland & Caithness, lasting from a single night to a full week, and staying in your preferred style of accommodation. Tell us about your other passions and we will be very pleased to create a unique, custom itinerary incorporating any aspect of general sightseeing, cultural/historical attractions or wildlife watching into your NC500 fly fishing tour. 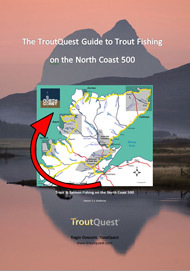 We are pleased to provide below for download, a visitor's guide to trout fishing on the North Coast 500. For your convenience there are clockwise and anti-clockwise versions to suit your direction of travel. Our intention is that these are living documents that will be updated from time to time.